Are there more than 2,000 MS-13 gang members in Virginia’s wealthy Fairfax County? In recent weeks, Gillespie has begun to assert that there are more than 2,000 MS-13 gang members in Fairfax County. We wondered whether there was much evidence to support this figure. MS-13, or Mara Salvatrucha, is a Central American gang that has been operating in the United States for decades. The transnational gang formed in Los Angeles in the 1980s, among members of the Salvadoran community who had fled violence and civil conflict in El Salvador. U.S. agencies have been dealing with enforcement and prevention of MS-13 activities since as early as 2004. MS-13, which operates in at least 40 states, is violent, but much of it is gang-on-gang violence. Gang violence in Central America’s Northern Triangle region (El Salvador, Honduras and Guatemala) has contributed to the surge in recent years of crossings by unaccompanied children and families over the Southwestern border into the United States. Fairfax County, meanwhile, has an estimated population of more than 1.13 million in 2016, of which 16.4 percent (185,166) are Hispanic. Fairfax County is the third wealthiest county in the United States, with a median household income of nearly $113,000. In context, 2,000 gang members out of more than 1 million people — especially if it is isolated to small pockets and restricted to gang-on-gang violence — is a relatively small number. But let’s see what evidence exists. The Gillespie campaign did not respond to repeated requests for comment, which is clearly suspicious. Obviously, there is no census taken of gang members. The population is relatively transient and not easily identified. So any figures must be taken with a grain of salt. The Justice Department has offered varying estimates for the number of MS-13 gang members in the United States, ranging from 6,000 to 10,000. The Trump administration has suggested MS-13 membership has climbed in recent years, offering a 10,000 estimate in April. But FactCheck.Org found that the Justice Department has been citing a 10,000 member figure since at least 2006, indicating there has been little apparent growth. A Fairfax County assessment in June, meanwhile, cited a 2015 police intelligence estimate that there are 2,000 gang members in the county, with the police identifying 80 different gangs. The Fairfax County report cited a 2015 youth survey, which found slightly more than 2 percent of high school students indicating membership in a gang – a figure that had dropped in half since 2008. But the U.S. Immigration and Customs Enforcement told The Washington Post in June that the estimated membership of MS-13 in the D.C. region — including Virginia, Maryland and the District — was between 900 and 1,100. That’s certainly less than 2,000, and it’s for more than Fairfax County. The D.C. region has a population of 6 million. But there’s a wrinkle. In 2009, the Northern Virginia Regional Gang Task Force issued a report in which it estimated that there were 3,000 MS-13 gang members in the NoVa region, an area with roughly 2.5 million people. Fairfax County is obviously the largest part of the region — about half the population — and the report said MS-13 was the largest gang in the county. Jay Lanham, a retired assistant chief of the Prince William County police and executive director of the task force, told WTOP in June that the number of MS-13 members was now “over 5,000 easy.” But when we reached Lanham, he backed away from the number. “They are so transient,” Lanham said. “It’s really just an estimate.” The task force maintains a database funded by the High Intensity Drug Trafficking Area (HIDTA) program, but he acknowledged it’s difficult to know if members listed in the database have left the area or are no longer in the gang. We should note that Northern Virginia Regional Gang Task Force has had its funding cut dramatically by Congress, from $3 million in 2012 to $325,000 currently. Lawmakers have cited its estimates — higher than police estimates — as a reason to bolster funding. “Most of the estimates from the police department are going to be on the low side,” Lanham said. Still, it’s strange that DOJ estimates would suggest there has been no gain in MS-13 membership across the United States over 10 years, while the Northern Virginia task force would claim membership in the region would nearly double in eight years. Despite Gillespie’s certitude, the plain fact is that no one knows how many MS-13 gang members are in Fairfax County. Gillespie is citing the highest possible estimate, in an effort to make the situation seem as bad as possible, particularly for people in vote-rich Fairfax County. In fact, under Gillespie’s math, Fairfax County by itself accounted for more than one-fifth of all of the MS-13 members in the United States, given the Justice Department figure of 10,000 MS-13 members nationwide. ICE, meanwhile, indicates the entire D. C. region represents just one-tenth of the MS-13 membership. That would suggest Fairfax County has less than 1/20th of the MS-13 population. Both Fairfax County police and ICE estimates for the region are much lower than the number Gillespie is touting on the campaign trail — a fact that he should acknowledge. 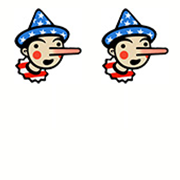 We wavered between two and three Pinocchios, given how Gillespie hypes this figure. But we ultimately settled on two because Lanham offered some backing for Gillespie’s statement, despite the much lower estimates by other official sources. "We know that there are more than 2,000 MS-13 gang members in Fairfax County alone."